First of all, the Chrysler Mopar Road Hazard coverage plan offers a full repair and replacement cost for all four tires. This means that they will give you brand new tires at the current aftermarket prices if you have a mishap that ruins your original tires. 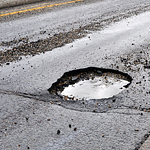 Additionally, it covers damages from curbs, potholes and other such road hazards. If the tire sensor gauge is damaged as a result of a road hazard, this coverage plan will fully replace it. Each covered visit will incur a $0 deductible. We here at Faulkner Chrysler Dodge Jeep Ram FIAT know you will appreciate this great tire insurance plan for the Chrysler Mopar. Come talk to us today and we will fill you in on all of the details!